"Who else thinks the adorable bento lunches all over pinterest are crazy? They look super tasty and are very cute but who are these people that have time to make kitten shaped sandwiches with carrot whiskers? Maybe I would be one of them if I spent less time on facebook...hmmmm...."
My kids are not what I would call picky eaters but they have some less than desirable eating habits. They're snackers. They eat some tiny amount of food every half hour all day. They're always hungry, I'm always making something in the kitchen and no one sits down for full meals. So, last week, I made a bento-style plate lunch with things I had around the house. I cut some fruit and veg into shapes and made sandwiches that look like bunny faces with baby carrot ears and they both sat down and cleaned their plates! I couldn't believe it. They never eat sandwiches and they certainly never clean their plates but they did it. 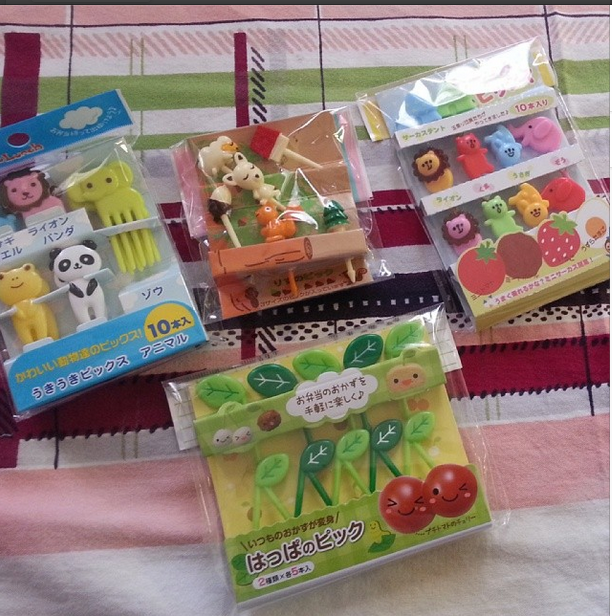 I found a local market that has a very small selection of bento supplies so I bought a few things to tide us over till my online order arrived. I can't stand the waste of disposable products but they make reusable silicone cups, silicone food dividers and everything washable so I can buy it all once and be done with it. The only bad thing about making bento lunches is that the kids are having so much fun, they want bento boxes for every meal of the day! Now that we're wasting less food and eating more meals, I guess that's not a bad problem to have...and I even enjoy hand-washing all of the cute little picks and shape cutters. I love kawaii bento lunches! 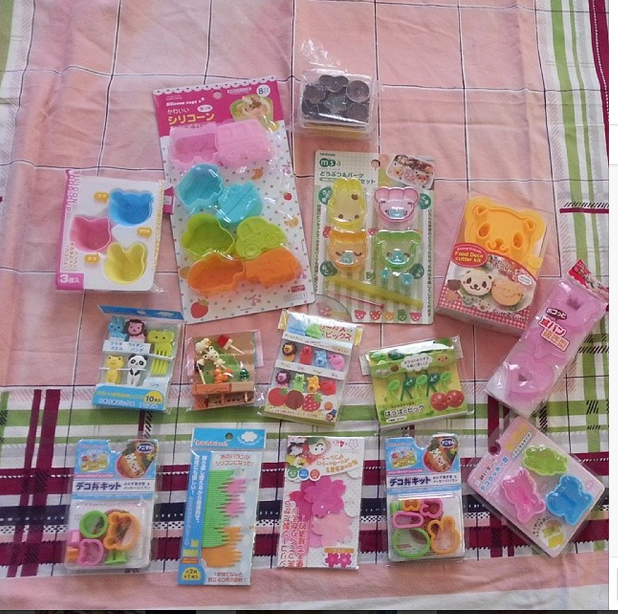 We are fortunate out here on the West coast to have two chains of Japanese dollar stores (Daiso and Ichiban Kan) which makes bento supplies shopping easy. 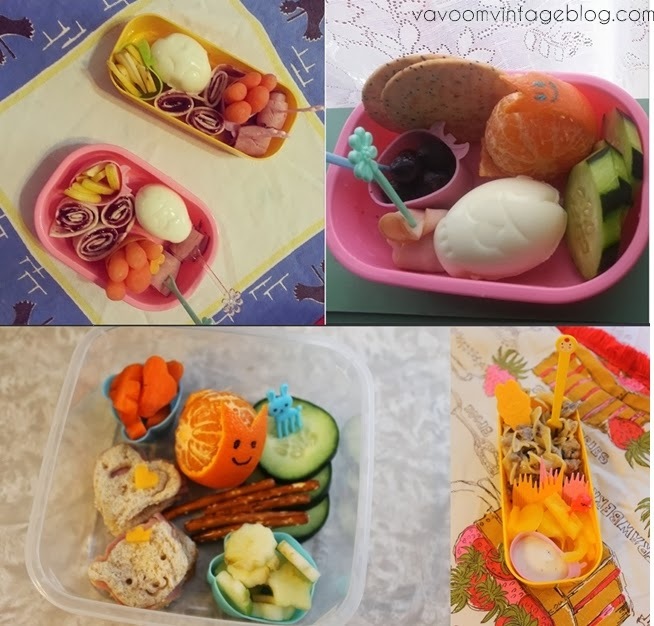 I hope that you will share some of your cute lunches on your blog! I absolutely LOVE bento boxes! LOVE THEM. I've been looking at those little boxes for my own lunch but haven't been ready to commit just yet. Why shouldn't kids and adults have food that's both tasty and fun to look at? We eat with our eyes first, tastebuds second. It's no wonder your kids are sitting for meals and cleaning their plates! I know I would. Oh yes! I've been making some for myself lately too. I've found that a lot of bento-makers use a simple square tupperware container instead of shelling out $20 for a lunch box...although I've found some pretty fab lunch boxes with all different compartments for things too. Can't wait to share all of my creations with you guys!! I adore bento - when I was at uni three to five days a week I would make it for myself (usually with at least somewhat Japanese cuisine as I love it) and it meant I actually ate lunch when I took it! I didn't always make cute faces, but there's something really awesome about having a super neatly set out lunch to eat! Bento is kompletely unknown here in Sweden. I'm a bit ashamed that I have promised my son a Totoro bento box for a too long time now. Those bentos looks lovely but as a full time worker and half time student, I can't see time to make those treats. We also have free school lunch. We discovered those several years ago and my daughters loved them. I think I ordered from Laptop lunches online. Your kiddos will love it but it keeps you busy. These bento items are over-the-moon adorable!!! I was so, so, soooooo into Japanese culture, fashion, food, you name it in my early to mid-20s and really fell in love with bento back then. I still adore it (though I've yet to buy any super cute/kawaii pieces like this) and like to pack bento-esque lunches for us when Tony and I go on day trips.